Below, you will find the Right-of-Way Rules for racing in a very brief and simplified form. They are intended as a starting point for new racers until they can become familiar with the intriguing intricacies of the current Racing Rules of Sailing. These rules are not intended as a substitute for the official rules which are available on the World Sailing site. 1. PORT/STARBOARD: When boats on opposite tacks meet, the port tack boat must keep clear. The tack is named for the windward side of the boat, i.e. the side opposite the boom. If, as you face forward, the right side of the boat is windward, you are on starboard tack. Otherwise you are on port (see diagram - right-of-way boat is white)! 3. TACKING: While you are tacking, you must keep clear of other boats which are not doing so. If you acquire the right-of-way over a boat near-by with a tack or gybe, you must give that boat reasonable room and time to react. 4. AVOIDING COLLISIONS: Even when you have the right of way, you must try hard to avoid any collision. In any case, hitting another boat is slow!! 5. 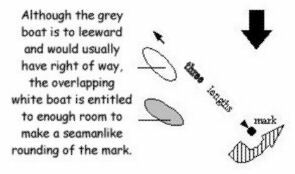 MARK-ROOM: When you round or pass a mark other than a starting mark, you must give room to round that mark to any boat that has an inside overlap on you as you get near (three boatlengths from) the mark. Under the new Rules, you should also avoid tacking to starboard within three boatlengths of a windward mark if any other boats are near you. 6. BARGING: The “buoy room” rule basically never applies at the start line. Do not barge there by trying to squeeze between a boat to leeward of you and a mark. Note that a committee boat that marks an end of the start or finish line is considered a mark. 7. OVER EARLY: If any part of your boat or equipment is across the start line when the start signal is made, you must re-start. While returning to the start line to re-start, you must keep clear of any boats that are not returning. Often the best approach in a crowd is to let your sails luff and slow down until you can return to the line without fouling anyone. 8. 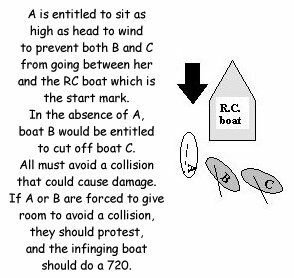 DEFENDING AGAINST OVERTAKING BOATS: If a boat tries to pass you to windward, you are entitled to defend your wind by luffing up but must do so in such a way as to give the windward boat room to keep clear (see also item #4). It is best to defend your wind by luffing up before a threatening boat gains an overlap. 9. TOUCHING A MARK: If you touch a mark, you may continue to race only after getting out of the way of other boats and sailing a complete circle. 10. RULE INFRINGEMENT: You are officially racing and therefore bound by the racing rules from your Prep Signal (usually the 4-minute beep) until you have cleared the finish line. If you break a rule, the racing rules and good sportsmanship require that you do a Two-Turns Penalty. As in item #9, you may continue to race only after immediately getting out of the way of other boats and, in this case, sailing two consecutive complete circles. Near the mark or the finish, however, such a foul looms much larger and you may well wish to protest. Or, if I am the one who committed the foul, I should definitely do my Turns without even being asked to! If you are fouled and you intend to protest, you must immediately yell (the actual word) “Protest!” If the offending party does Turns, you can forget the matter. Otherwise, you inform the RC, at the finish line, whom you are protesting. When you reach shore, you fill in a protest form and attend a hearing that will decide the protest.